Hvar Town harbor. The large roofed building in the plaza was built by the Venetians in 1611 as an Arsenal to service their warships. The doors were so large that even galleons could sail directly inside its cavernous interior to be rigged and repaired. Hvar island, dating back to the first millennium BC, is considered by many to be the jewel of all the Adriatic islands—some say it’s the best in all the Mediterranean. It’s the longest island in the Adriatic, stretching itself some 68km, but narrow enough to make riding around on a scooter terrific fun. Hvar Town is where most of the action is, fueled by jet-set elite like Tom Cruise, Beyonce, Russian billionaires and very hot night life. The harbor, guarded by a Venetian-era fortress perched high above the town, is gorgeous. Add gleaming mega yachts, lots of villas, hotels, posh restaurants, fancy shops and it’s no wonder that Hvar has established itself firmly as a world-class island destination. As Solta is known as the island of olives, Hvar is known for its wine. And it’s delicious. There are a number of wine tours and most include tastings and visits to the wonderful groves that dot the island. But Hvar is also Stari Grad’s Ager, which in 2008 was named to UNESCO’s World Heritage list, a Greek era agricultural plain where grapes and olives have been under continuous cultivation for more than 24 centuries. 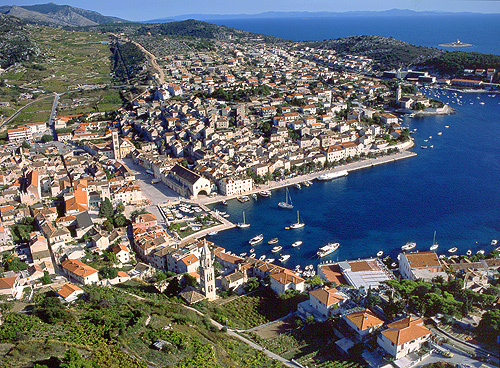 And then there’s Jelsa, a lovely laid back village, a short drive from Stari Grad, the main ferry port. Although the majority of tourists come to Hvar Town and never get to see Stari Grad, Jelsa, or the island’s rustic interior, we strongly recommend that you do. Since town buses meet all ferries to take you all over the island, it’s a great day trip without a car….or rent a scooter. We take the morning catamaran from Split, bus around the island and then the early evening ferry back to Split from Stari Grad. Be sure to pick up a free copy of DiscoverHvar on the island, in Split at the tourist offices. It’s also given out on catamaran/ferries to Hvar during the season. There’s a lot more to Hvar island than its Old Town, so be sure to take the time to enjoy as much of it as you can! –Ante has a great selection of tours, speedboat rentals, more and really loves American Blues! –Vese is a quintessential adventuress and her crew offer the best biking, kayaking, free climbing and more! –a labor of love from Paul Bradbury, a British ex-pat who has lived on Hvar for more than a decade.